Interdimensional Transmissions presents revered techno institution The Bunker New York for an official Movement afterparty. This is truly a family affair, with a lineup of affiliates and close friends of The Bunker and I.T. "The Roman theme opens a world to explore beyond both of our past endeavours," says Auvinen, explaining the conceptual genesis of the collaboration. "In the same way Ennio Morricone may have conceived the 'Spaghetti Western' genre by fusing together various contemporary motifs and moods to conjure the spirit of a past era, we're imagining stories and scenes from the Roman era, trying to manifest narratives while celebrating the distortions we see looking through the murky lens of time." 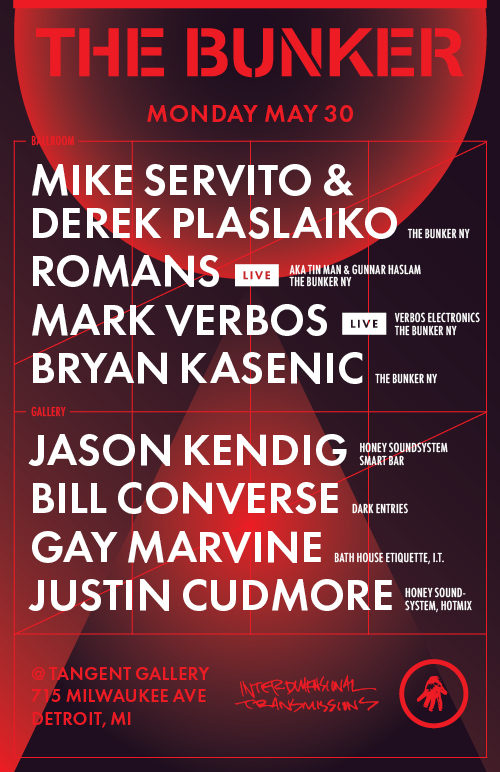 Inspired by the electronic music emanating from Detroit's airwaves while coming of age, Jason Kendig has been immersed in the dance music community for over two decades. From his first residency at Detroit's infamous club Motor to his current residency at Chicago's highly lauded Smart Bar and as an integral member of Honey Soundsystem–a queer collective of musicians, artists and djs known for elevating nightlife in San Francisco and beyond–Jason never fails to make others move through his ability to reference dance music's past yet keeping an ear to the future. Techno producer Justin Cudmore’s coming-of-age as a fan and creator of dance music happened amidst the wide expanses of central Illinois. As a kid growing up in the state’s tucked-away capital of Springfield, he played the drums at home and in school as a jazz percussionist. But where most of his peers were tuned into pop music, Justin was wearing out self-made mixes and classic disco compilations. Then as a student in the college town of Champaign Justin dove further into electronic music, workshopping new-wave influenced beats in bands and DJing parties, primarily at the club night Physical Challenge, which he started in 2007. But he fully came into his own in cities across the country and world. While studying in Norway, Justin was a regular at monthly parties thrown by Todd Terje and Prins Thomas. He moved to Chicago after college and began working for the influential dance music blog Little White Earbuds, which opened him up to the city’s thriving underground house and techno scene. Currently, Justin is a fixture across Brooklyn, popping up on dance floors and behind booths, where he has spun records at his Hotmix parties along with Mike Servito and Gunnar Haslam. Through it all, Justin has remained a student of history who recognizes that house and techno still drip with the sweat of its pioneers. Much like the teenager who burrowed deep into his own mind, Justin prefers old sounds over new. He has spent years digging into crates both digital and physical, gathering inspiration for his own productions, which marry snaking acid lines and bouncy grooves to samples that have remained close to his heart. 2015 saw his track, "Feeling,” released on the Denver-based label Deep Club. His newly released 12" on Honey Soundsystem records is currently the talk of the town, and he has a track on techno veteran Heartthrob's ISNISNT label coming this summer.